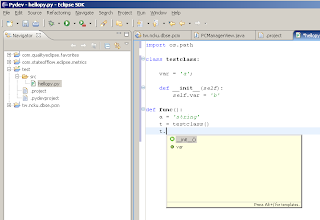 PyDev 是一個可以用來做 Python 以及 Jython programming 的 Eclipse-based Plugin. 之前有試用過(還不到 1.0 版的時候), 當時還很陽春, 但已經算是好用了. 昨天猛然發現已經到 1.2.9 版了, 而且在 1.2.8 版就加入了 code-completion, auto-edit, 以及 refactoring 的功能. 對於我來說這三個都還蠻重要的, 可以很有效地加速開發. 不過我很好奇他的 code-completion 是怎做到的, 畢竟 Python 不同於 Java, 要在 programming 時很快地推論出 type 似乎不是很容易的事情. 可能是在做 programming 時, PyDev 在背後不斷地進行 interpretation, 保留 code information 吧, 之前稍微嘗試寫過 Eclipse Plugin, 大概知道怎樣做到. This entry was posted on 下午12:53 and is filed under IDE , python . You can follow any responses to this entry through the RSS 2.0 feed. You can leave a response, or trackback from your own site.